Why "honest"? Well, there was nothing fancy about it. Sometimes I stand in the kitchen, look about and think, "I can't cook. I have to thaw the meat. I don't have potatoes. It's going to take 45 minutes and I'm tired and want food now." So, I grab a yogurt, go sit in the recliner, eat and then read the paper or scratch ears or go to the computer. That's supper. That's it. While yogurt is, by far, much better for me than a bag of chips, one yogurt for a whole evening does not a supper make. Plus, I'm setting myself up for either skipping lunch at the office the next day because there weren't any left overs, or making me go out and get something. Two sandwiches at Subway for $6.62 with tax may be a bargain, but when you're watching your pennies, you shouldn't be going to Subway for sandwiches. I love to cook, but it seems lately, my desire has been for instant now food. I don't want to spend the time to cook the meal that is good for me both for my health and my pocketbook. I'm tired. I'm depressed. My knees and my hands hurt. It's hard to motivate myself with all this extraneous stuff going on in my head. Every so often, I can break through the noise and cook myself something. That's what I did on Thursday night. It was meatloaf. Meatloaf is not fancy. You can make it fancy but, by basic ingredients, it's not fancy. This was a new recipe. Not sure where I found it since it was cut from the pages of something. 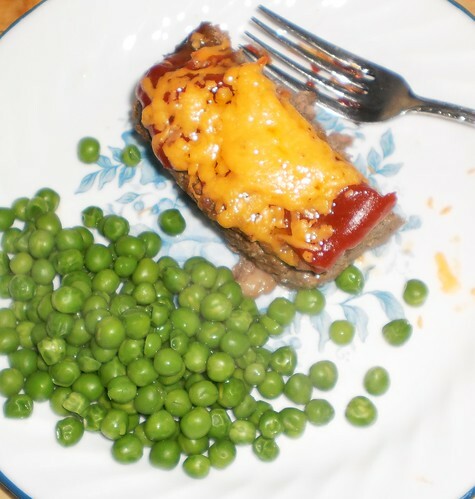 "Quick Cheeseburger Meatloaf" is the name. They were not kidding quick. 20 minutes to assemble. 30 minutes to cook. That's hamburger, dijon mustard and crushed saltines. 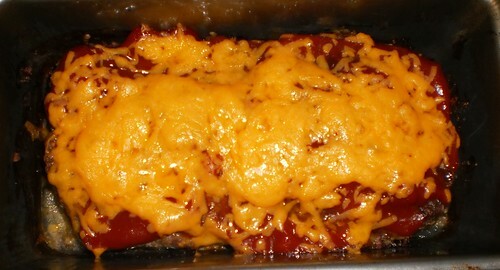 Bake for a half an hour and when it comes out, put a fourth of a cup of ketchup or catsup on top of it and top with 3/4 cup shredded cheese. Bake for 5 more minutes until the cheese melts. Now, when I do this again, I will not use 96/4 hamburger. That's 96% lean. I don't know how I got a package of that since I usually buy 90/10. But it's what I had. 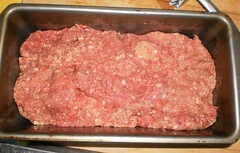 The meatloaf was a little dry because there was very little fat to keep it moist. If you use the 96/4 meat, I would cut the baking time by 10 minutes. The edges were a bit crisped. Now Jessie is going to laugh but I nuked some peas and there is my supper. I have ample meatloaf for 4 more meals. All I have to do is add vegetables and I have frozen corn, peas and peas and carrots from which to choose. Simple and quick. On the weekend, I can try the 15 step dishes. During the week, I need the 4 ingredient, 20 minute recipe.